ESCOLAR (CDR W. J. Millican) departed Pearl Harbor on 18 September 1944, to proceed to Midway to top off with fuel. There she joined CROAKER and PERCH and left on 23 September to conduct a coordinated patrol (ESCOLAR's first patrol) in the Yellow Sea north of 30° 00'N. Commander Millican was in command of this coordinated attack group, which was designated "Millican's Marauders." On 30 September, when ESCOLAR was estimated to be about north of the Bonin Islands, the following partial message was received from her: "This from ESCOLAR X attacked with deck gun boat similar to ex-Italian Peter George five OTYI- - - -". Although no further transmissions have ever been received by bases from ESCOLAR, which was forced to break off the transmission and the engagement with the gunboat at this time, the Commanding Officer of CROAKER has stated that she suffered no damage and was in frequent communication with PERCH and CROAKER until 17 October 1944. PERCH reported that on 17 October she had received a message from ESCOLAR stating that she was in position 33° 44'N, 127° 33'E, and was heading for Latitude 33° 44'N, Longitude 129° 06'E. Neither PERCH nor CROAKER could raise ESCOLAR by radio after this transmission was received. 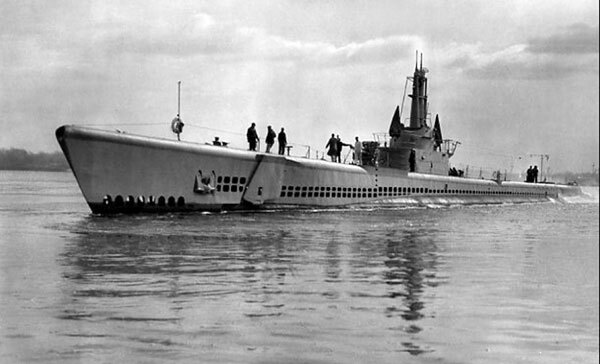 Had ESCOLAR left her area on the scheduled date, she would have arrived at Midway about 13 November 1944. All attempts to contact ESCOLAR failed and she was reported on 27 November 1944 as presumed lost. It is assumed that she was lost about 17 October. Information supplied by the Japanese on anti-submarine attacks gives no clue as to the cause of her loss, but the Yellow Sea area is thought to have been mined. A course line plotted between the two positions given above does not cross any known Japanese mine lies, but positions of mines laid before April 1945 are not definitely located. The known minefields in Tsushima Strait were laid in April 1945. However, there were mines in the general area of ESCOLAR's predicted position, and the most likely explanation for her end at present is that she detonated a mine. See also Ed Howard's Final Patrol page on USS Escolar (external link).